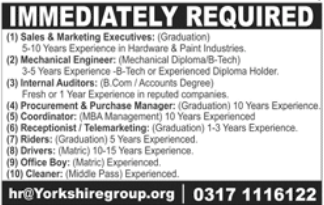 Tele Marketing Executive Job is available with Yorkshire Gorup in Pakistan, Lahore. It is a Senior Level level role. This applicant should be Bachelor Degree qualified for this position. This job will expire on 06 March 2019. This job involves skills like Good teamwork skills,	Adaptability,	Strong attention to detail, and Marketing. Experience required is 1 to 2 Years. Good teamwork skills,	Adaptability,	Strong attention to detail, and Marketing.